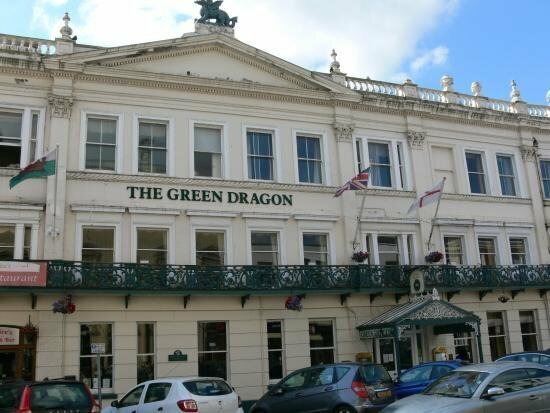 Hereford's historic city centre Green Dragon hotel has gone on the market for Â£3.5million with Bristol estate agents Christie and Co. it is the largest hotel in the city centre. On 2nd February 1461, during the Wars of the Roses, a Lancastrian force, including Bretons and Frenchmen, was intercepted and defeated by the Yorkist Edward, Earl of March at the Battle of Mortimer's Cross, 25 kilometres north-west of Hereford. One of the Lancastrian leaders, Owen Tudor, was captured and taken into Hereford. Owen was a high-ranking nobleman - he had married Catherine of France, the widow of Henry V.
Legend tells that it was at the forerunner of the Green Dragon Hotel in Broad Street that Edward stayed with his prisoner after the battle. The next day Owen was taken out to be beheaded in the market place (High Town). At first Owen was unable to believe that he would be executed - but when the collar of his red velvet doublet was ripped off he accepted his fate saying "that head shall lie on the block that was wont to lie on Queen Catherine's lap". Owen was called â€˜the handsomest man in Englandâ€™, which might have inspired what followed. His head was placed on the market cross where a madwoman combed his hair and washed the blood from his face. She lit more than a hundred candles, which she placed around the cross. Owen's body was afterwards buried in a chapel of the Greyfriars priory just outside the town. Owen Tudor was the great-grandfather of Henry VIII. Edward (later King Edward IV) was himself Henry's grandfather. Edward was back in Hereford that September, by now the battle of Towton had been fought and he was King of England. Â£3.5 Million eh! And how much more to bring it near to being the prestige hotel it should be, and has been, in the City? I suspect it may be too far gone for the majority of potential investors, would require some fairly major work to bring it up to a decent standard. I suspect it may be out dated with respect to the latest electrical/fire safety regs by now. The current owners really have let it go badly over the last few years. HV got this story out there 24 hours before the HT caught up again. Hotel is in desperate need of investment, if enough money was spent on the place it could become the centre peace of our city once again. . . , and no car parking!!! They do have parking Harry, or at least, they did, in a yard accessed from Aubrey Street, behind the burger shop. Plenty of hotel private parking around the back of the hotel, what you on about?